How Hot Should I Set the Water Heater? How Does a Commercial Grease Trap Work? The commercial grease trap (aka grease interceptor) is a basic part of the plumbing and sanitary system of mos t restaurants and food service establishments. In order for an establishment to remain up to code, it must have a properly installed and working grease trap that receives regular maintenance to clean it out. And these jobs have to be done by a professional commercial plumber. A grease trap is in place to prevent fats, oils, and grease (collectively known as FOG) that go down the drains from entering into either the public sewer system or the septic tank. FOG can quickly clog up pipes and create major obstructions, so as much as possible should be kept from going through the drainpipes. Grease traps are especially important for businesses that must rely on a septic tank rather than the municipal sewer system, since they can rapidly clog up the tank and cause a backflow of sewage into the building—an almost certain health code violation! Grease traps have been used for over a hundred years, and the technology behind them has changed very little during that time. Most grease traps are called passive grease traps or gravity grease traps because they need very few mechanical components—the force of gravity to separate FOG from the water is enough to handle most of the work. Commercial grease traps usually can hold between 1,000 to 2,000 gallons and are buried in the ground outside the building, between the plumbing and the sewer system. If you’ve ever seen grease in the water, you’ll know that it floats to the top. This is how a grease trap is able to keep FOG from the sewer system. Water filled with FOG enters the reservoir of the grease trap. The reservoir allows the water to settle so the FOG rises up to the top. Solid food waste, which is often in the water, is heavier and will sink to the bottom of the trap. The FOG layer is referred to as the “scum layer” and the foods layer as the “sludge layer.” The wastewater remains in the middle, where it’s pumped out through a pipe placed to only draw from it. The waste water continues to the municipal system, with most FOG and food now removed. Some fats and grease will still get through, but 85% will remain in the trap. You’ll notice there’s no method to remove the scum and sludge from the trap afterwards. This is why grease traps need regular emptying and cleaning. If it the scum and sludge are allowed to build up, the trap will simply send the FOG into the sewer system, defeating the whole purpose of the trap. You’ll need regular service for your grease trap to ensure it works for your establishment, not against it. 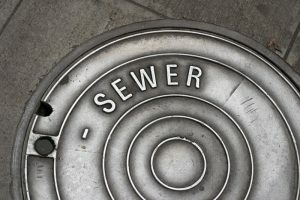 Grease traps can corrode and develop leaks that will require a commercial plumber in Riverside, CA to fix the problem. You can trust the work to our commercial experts! Sweetwater Plumbing—We don’t charge by the hour, we charge by the job! Schedule commercial plumbing of any kind with us.